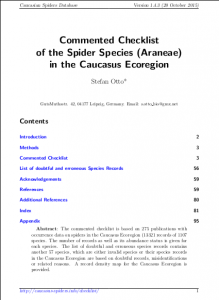 Abstract: In the largest systematic spider collection effort in a single location in the Caucasus Ecoregion, across several altitudinal zones and throughout the entire vegetation period of one year, 426 juvenile and 359 adult spiders belonging to 69 species from 48 genera and 19 families were collected in the Lagodekhi Reserve (Georgia) in 2014, using Malaise traps on a transect with seven study plots between 666 and 2559 m in the montane, subalpine and alpine vegetation zones. Phoroncidia pilula (Karsch, 1879) is recorded in the Western Palaearctic for the first time. Thirty-eight species are recorded in the Lagodekhi Reserve for the first time, raising the number of spider species of this reserve to 202 species, five additions are first records for the Caucasus Ecoregion and ten species are first records for Georgia. Diagnostic drawings and analyses are provided for 13 species, e.g. Megalepthyphantes pseudocollinus Saaristo, 1997, Phoroncidia paradoxa (Lucas, 1846), P. pilula (Karsch, 1879) and Trochosa cachetiensis Mcheidze, 1997. 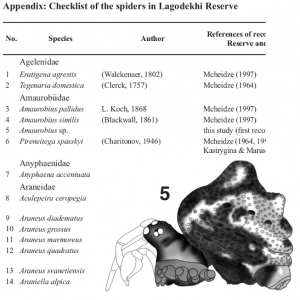 An updated checklist of the spiders in the Lagodekhi Reserve is provided. Dieser Beitrag wurde am August 13, 2018 von Stefan in New Publication, Research veröffentlicht. 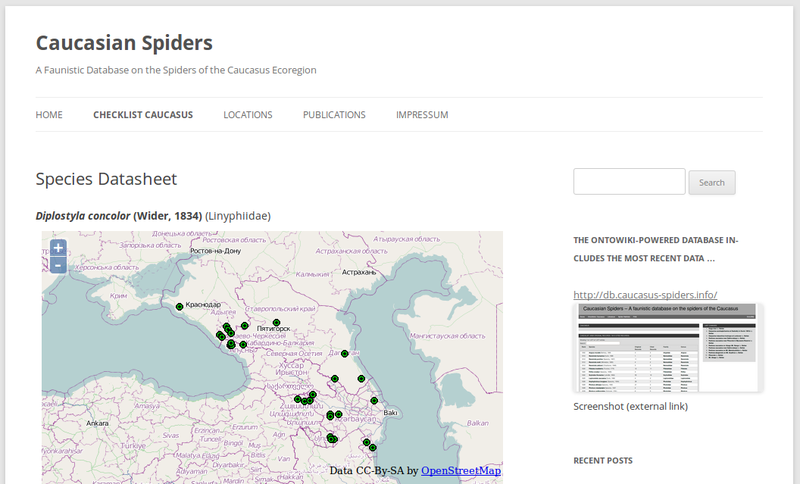 Schlagworte: Caucasus, Georgian Spiders, Lagodekhi, Publications, spiders, study, taxonomy, transect. Abstract: Precise information on spatial patterns of species richness and endemic species distribution is important for effective species conservation. In the Caucasus Ecoregion such information is virtually non-existent for invertebrate taxa. Using occurrence data from a large database we calculated species distribution models with the GARP algorithm for 471 spider species to visualize the diversity distribution of spider species in this region. Overall species diversity was highest in mountain forests of the North Caucasus, east-central Georgia, the southern slopes of the eastern Great Caucasus and south-east Azerbaijan. A regression tree analysis Chi squared automatic interaction detector method revealed the mean temperature of the driest quarter and precipitation parameters to be the main environmental factors shaping these patterns. Diversity of endemic species was correlated with overall species diversity but hotspots of endemic species (10+ percent of all species) exists in high-mountain areas, suggesting post-glacial speciation events in the high mountains as the main sources of high endemism in Caucasus. Further information on the spatial distribution of species diversity of invertebrate taxa in the Caucasus Ecoregion is needed to improve conservation efforts in this biodiversity hotspot. Dieser Beitrag wurde am Juli 4, 2014 von Stefan in New Publication, Research, Uncategorized veröffentlicht. 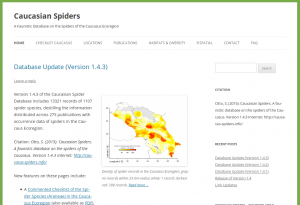 Schlagworte: Caucasus, Publications, Species Distribution Models, spiders, study.